Multimedia giant with weak display. Acer refreshes its elegant Ethos range with Intel's speedy Sandy Bridge processors. 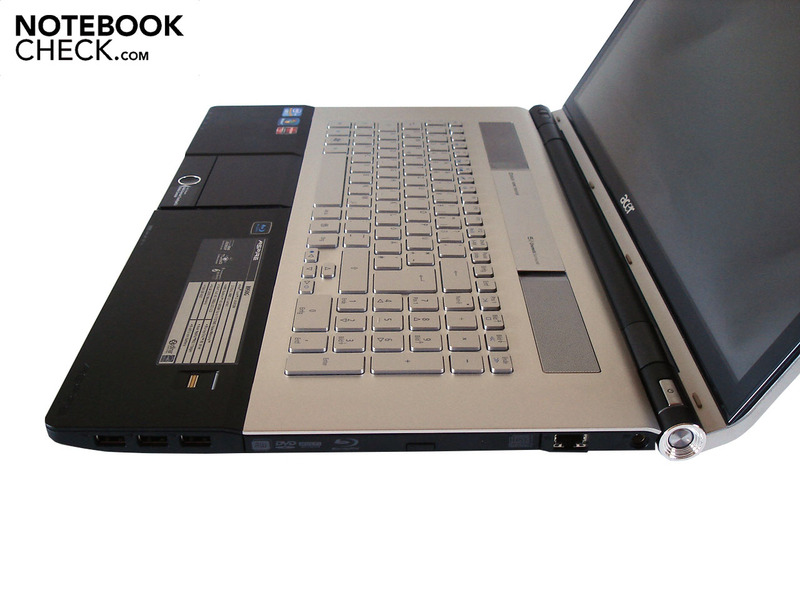 The Aspire 8950G is lavishly equipped with a 16 GB RAM, a hard disk with a capacity of 1.5 TB and BluRay burner. Is a price of 1800 euros justified? If you are looking for a multimedia notebook with a chic design and a lot of power under the hood, you'll be just right in Acer's Ethos range. 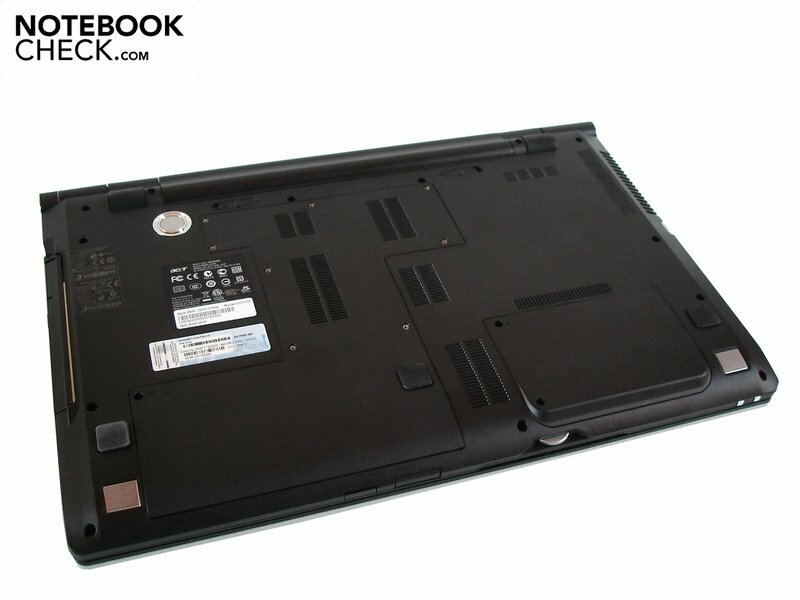 In addition to the 15 inch Aspire 5950G, the manufacturer also has the 18 inch Aspire 8950G available, which we grabbed for a detailed review. Consumers will still have to be patient, though. 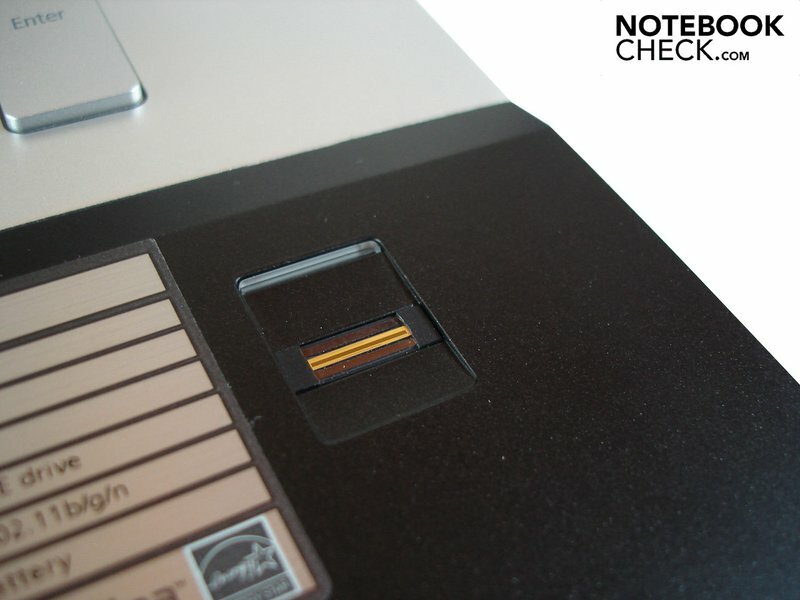 The notebook will presumably first be available in a few weeks due to Intel's faulty Sandy Bridge chipsets (see report). Regardless of that, various retailers currently list both following models: The Aspire 8950G-2634G75Bnss is offered for 1400 euros. 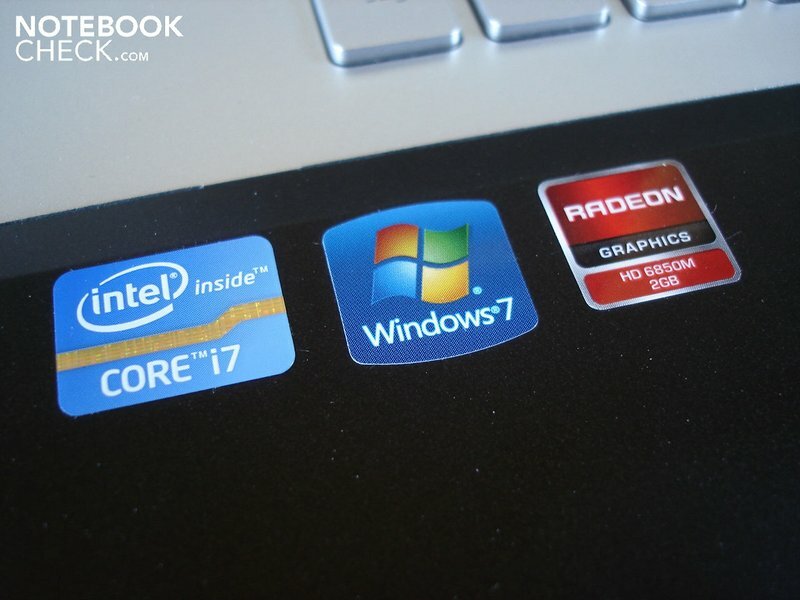 It has a Core i7-2630QM, four GB of DDR3 RAM, a 750 GB HD and a BluRay burner. 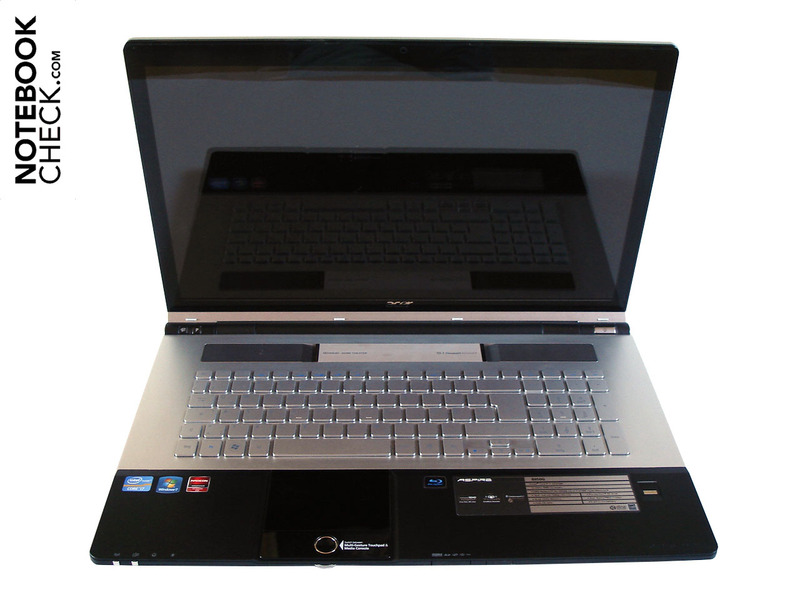 The tested Aspire 8950G-263161.5TWnss costs 400 euros more, but it has a 16 GB DDR3 RAM and two hard disks with a total capacity of 1500 GB. An AMD Radeon HD 6850M is used as the graphics card in both models. Due to the omission of DDR5 VRAM, it unfortunately is only located in the midrange. Finally, there aren't any surprises as to the operating system: Windows 7 Home Premium 64bit is standard. In comparison to the predecessor, Aspire 8943G, the case remains unchanged. Numerous color and design transitions bestow the 18 incher with a fresh and unique exterior. 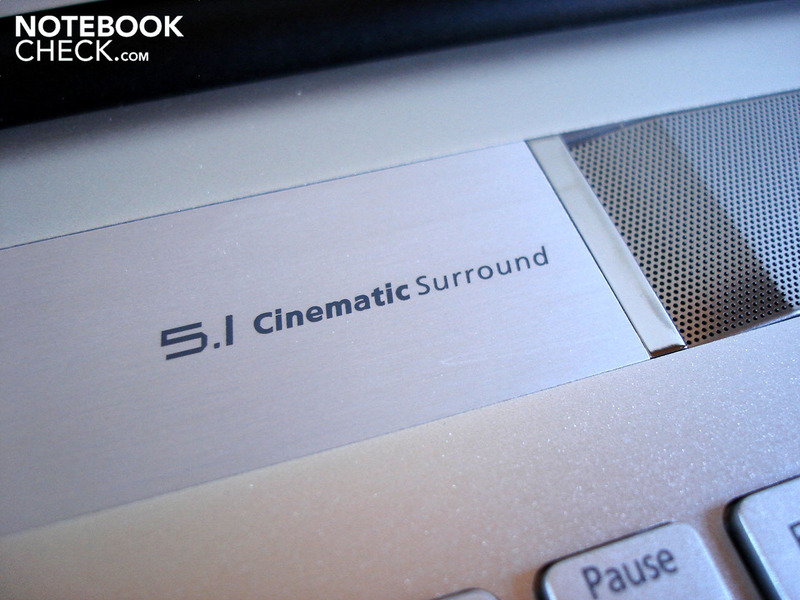 Beyond that, the notebook's lid and keyboard environment are made in an elegant aluminum look. The surfaces are not only resistant due to the matt silver finish, but also create an impression of high-quality at the same time. Merely the display bezel soon annoyed us. Fingerprints quickly accumulated on the high-gloss surface. In terms of stability, the chassis doesn't have to accept any reproach whatsoever. We could provoke a slight yielding only under stronger pressure. In return, the hinges couldn't convince us a much. Despite a weight of almost four kilograms, the base unit lifts when we open the lid. "Portable" is a quality that doesn't apply to the Aspire 8950G in any way. 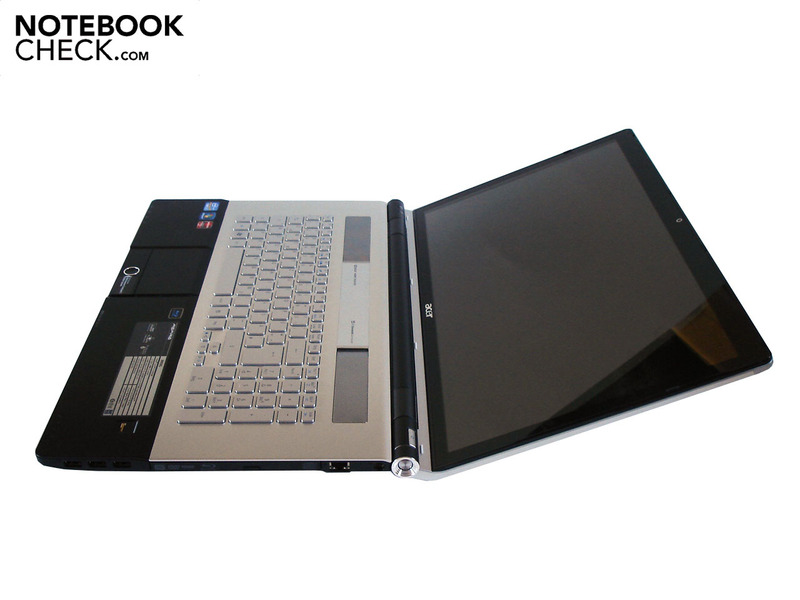 The notebook has been primarily conceived for stationary use considering a size of 440x295x41 millimeters. The connectivity also equals the predecessor model – with exception of a decisive detail. We will start with the right, where three USB 2.0 ports, a RJ 45 Gigabit LAN port and the power socket are assembled. 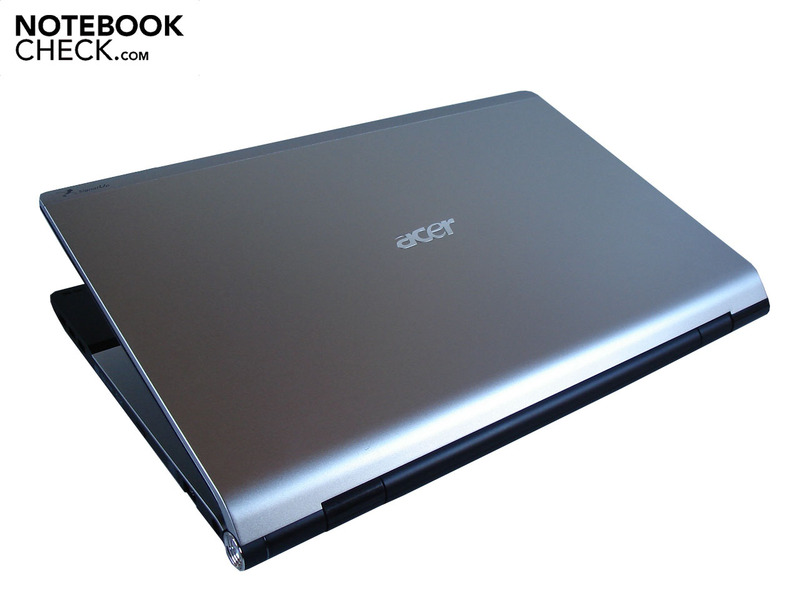 Acer has accommodated a multi-in-1 cardreader and an infrared sensor on the front. The left is particularly well-equipped. Beside a Kensington lock, a VGA, respectively HDMI out, and an eSATA/USB 2.0 combo, it also harbors a Firewire port and three audio sockets. 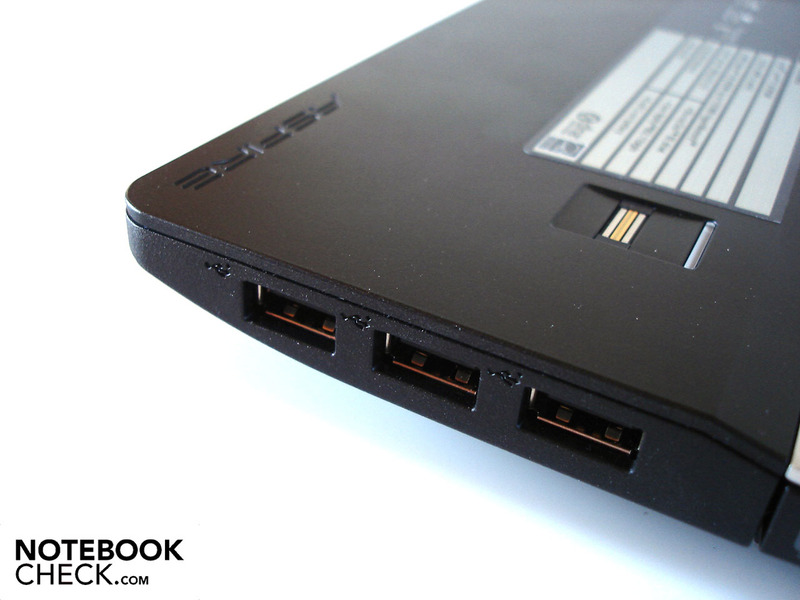 In place of a fifth USB 2.0 port, as in the Aspire 8943G, a cutting edge USB 3.0 port joins the team. We find the port positioning absolutely imperfect. 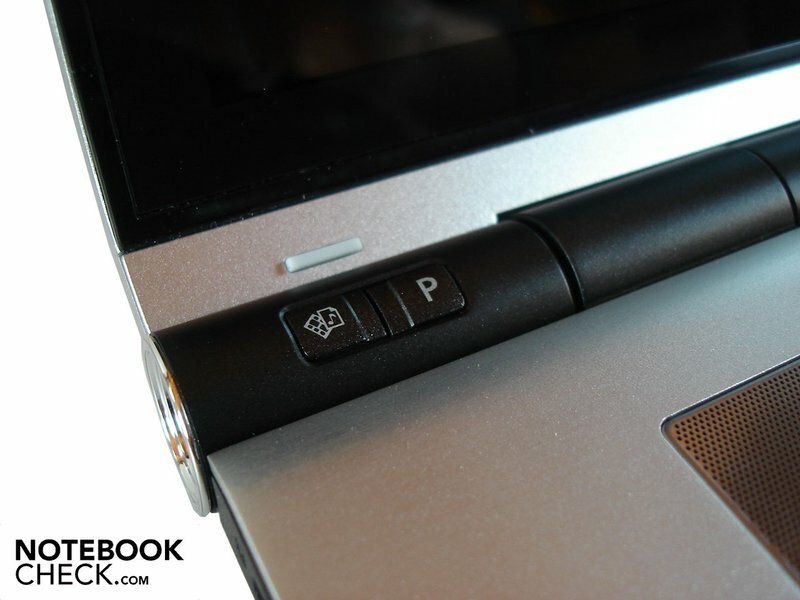 Acer has placed the majority of interfaces so far front that the elbowroom on the sides suffers considerably when many cables are connected. There's nothing to complain about in view of wireless communication. WLAN (802.11n) and Bluetooth (version 3.0) belong to the configuration features. As usual, Acer stuffs the notebook full of software. This doesn't only have an adverse effect on the boot time and the responsiveness immediately after the start, but also occasionally annoys with pop ups. 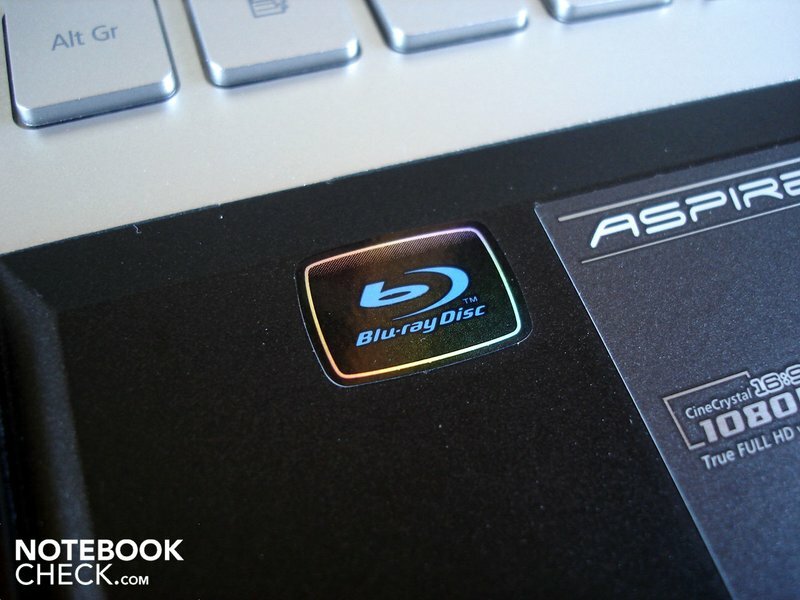 The Aspire 8950G first develops its real potential after a comprehensive software removal. The scope of delivery is by no means exceptional, but at least good. 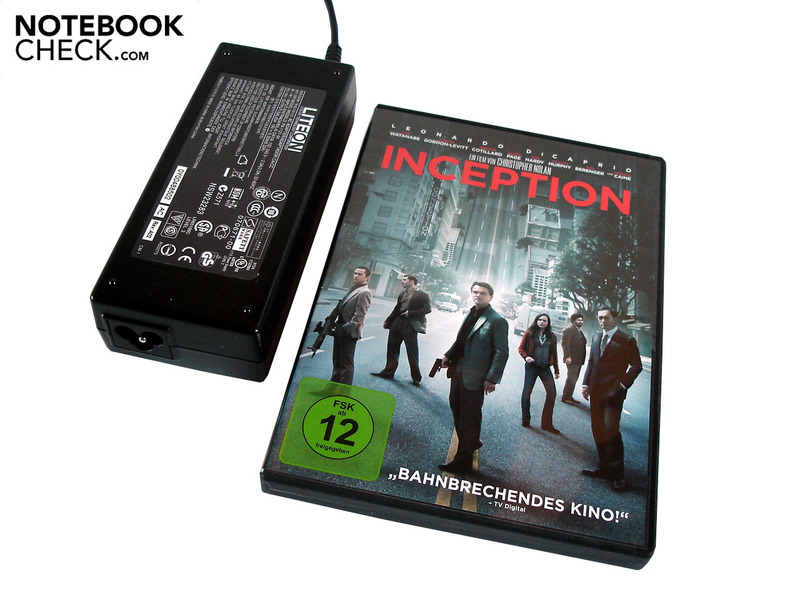 In addition to the adapter and battery (87Wh, 6000 mAh), Acer includes a BluRay disk with a few trailers, a driver and tool DVD and a cleaning cloth in the package. The supplies are complemented by a warranty leaflet and a short manual. 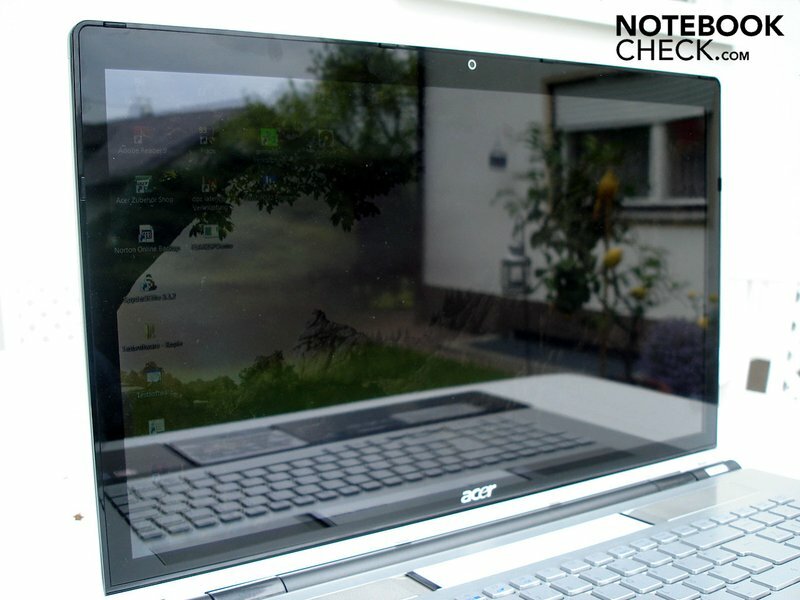 Acer grants its customers a warranty period of 24 months. It is a bring-in service. The warranty is even valid internationally for 12 months. The keyboard currently used isn't one of Acer notebooks' strengths. Most models (e.g. Aspire 7745G) have extremely wobbly and spongy keys, which excludes a clearly defined trigger response. 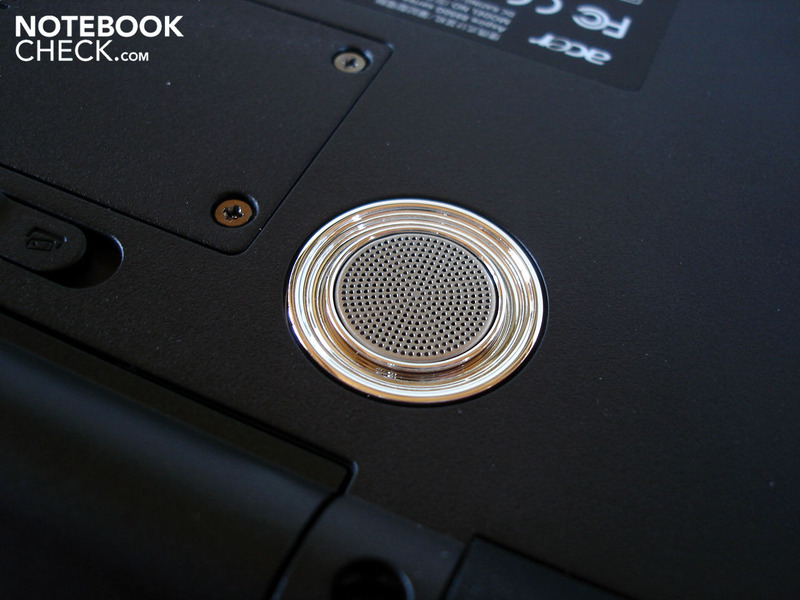 The Aspire 8950G has luck in this regard. Although the pressure point and keystroke could still be clearer, the typing feel is nevertheless acceptable. 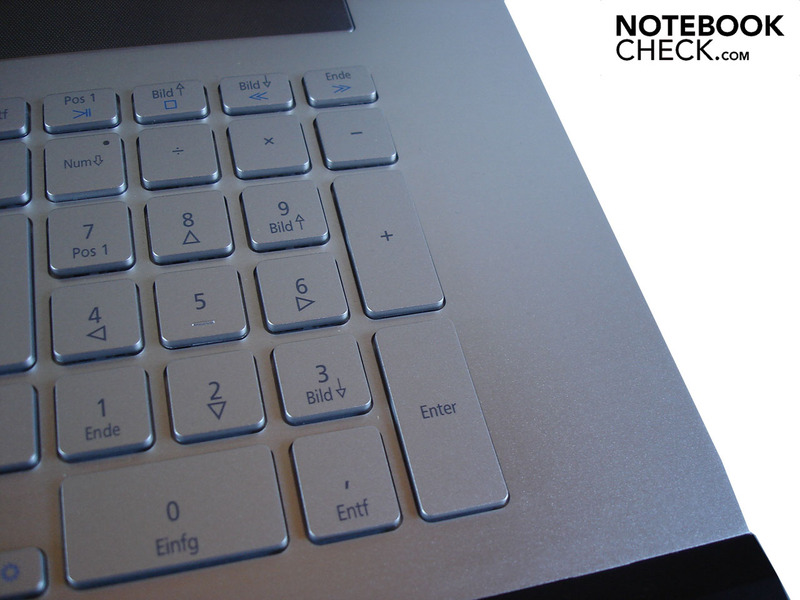 Moreover, the separated keys – with exception of the arrow keys – are well sized and cleverly arranged. As to the key lettering, Acer has completely missed the target. The keys are hardly legible from some angles. The fairly clattery typing noise also lacks a certain level of quality standard. By the way, Acer has not installed a practical light, either. 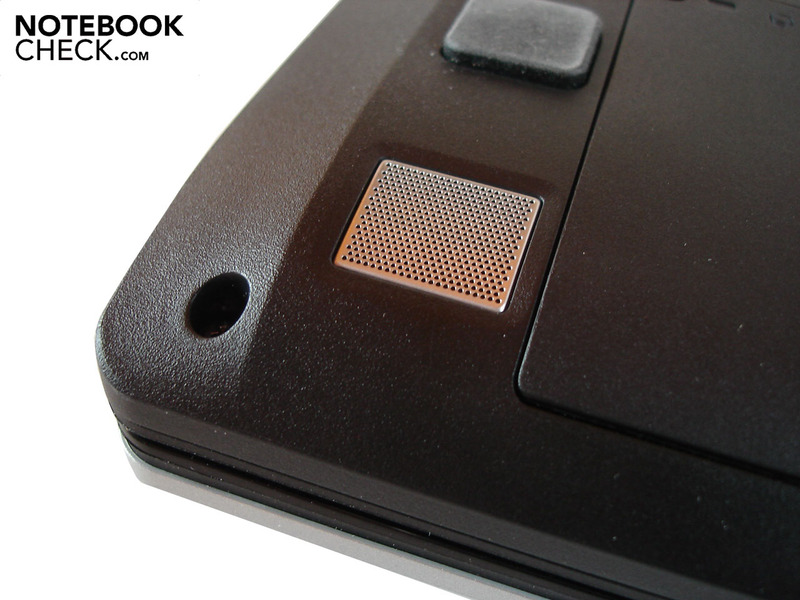 Theoretically, the Aspire 8950G's touchpad has an interesting factor. 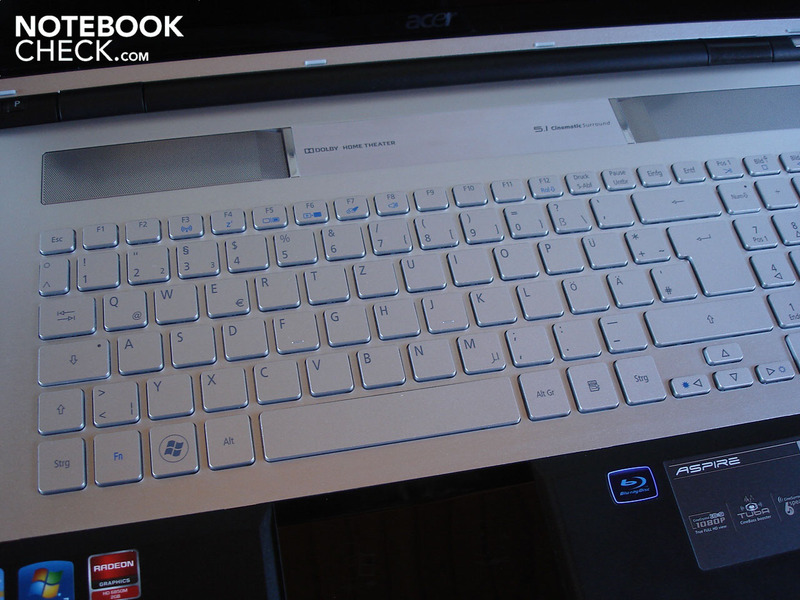 Namely, Acer has given the touchpad to two different operating modes. Aside from "normal" multi-gesture operation with multi-finger support, you can enable a media panel when required. 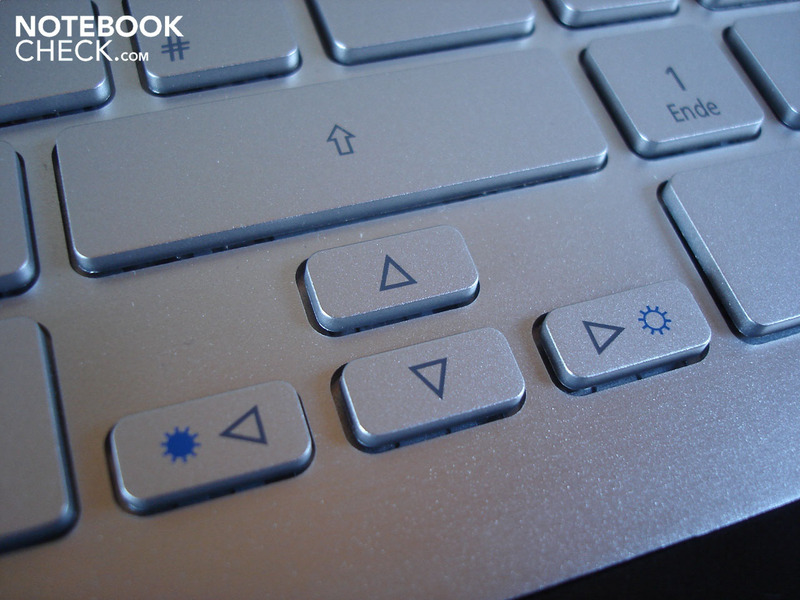 Here, various symbols appear on the touchpad, which facilitate music and movie control (start, stop, forward, reverse, etc.). However, the touchpad fails in practical use. Acer has opted for a high-gloss touchpad surface, which has – we'll say it as it is – miserable gliding traits. Consequently, a fair amount of pressure is needed to move the mouse cursor over the screen. At least the size is convincing. 90x54mm is above average. 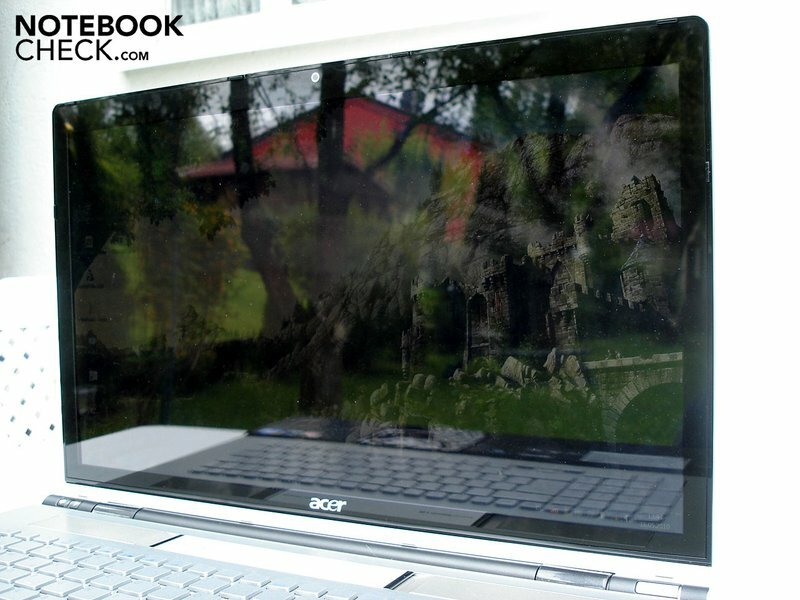 Matching to an 18.4 inch size, Acer has opted for a FullHD solution. Two adjacently opened windows can be managed easily due to 1920x1080 pixels. The user doesn't have to make compromises with high resolution videos, either. An aspect ratio of 16:9 reduces the typical black bars. In view of the rates, the display is regrettably a bitter disappointment. The installed Chi Mei N184H6-L02 screen has a fairly poor brightness despite the LED backlight. An average of 162.3 cd/m2 may be enough for office and internet applications, but it clearly lacks brilliance in games and movies. On the other hand, the black value has turned out too high. Dark areas visibly drift off into gray with 0.84 cd/m2. It can't be described as a saturated black in any way. This adds up to an overall moderate contrast of 204:1. The colors look fairly pallid and the picture makes a rather undifferentiated impression. 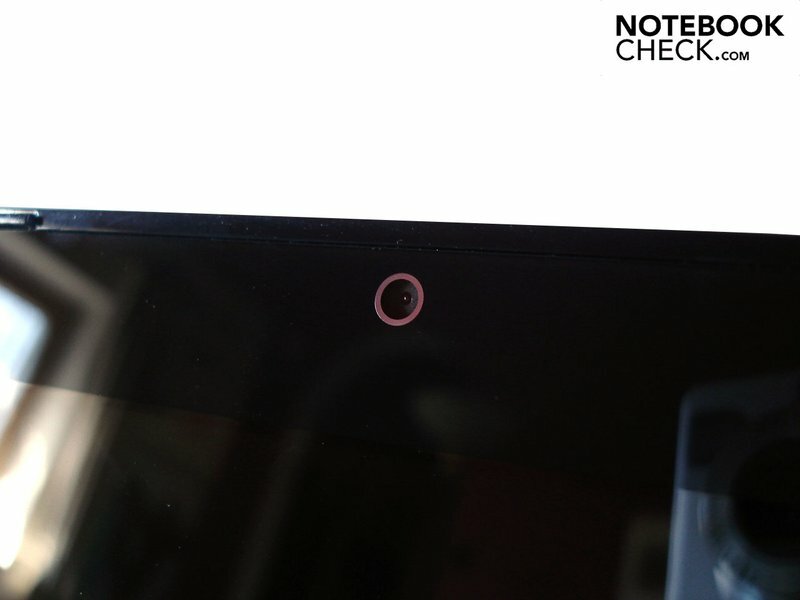 Summarized: The picture quality isn't even close to being worthy of an 1800 euro multimedia notebook. Movies and games lose too much of their atmosphere without a (good) external monitor. 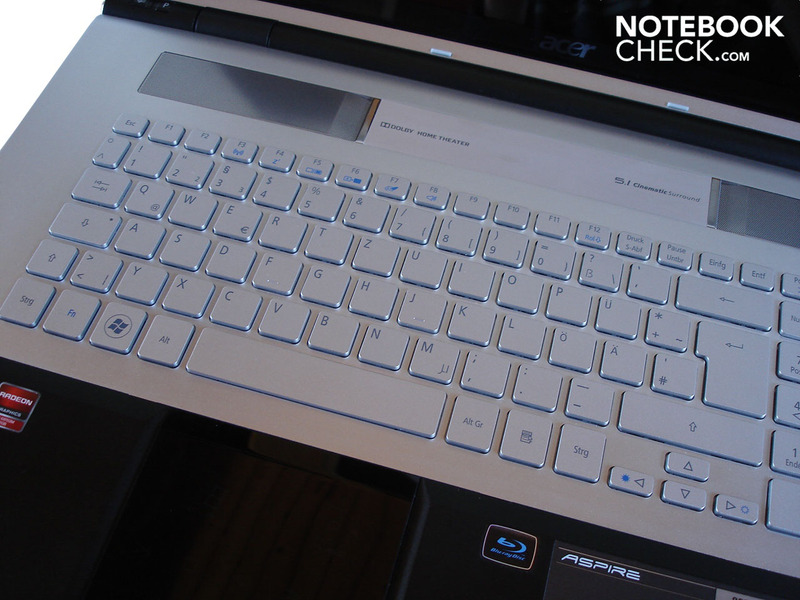 Other notebooks, such as the Asus G73SW, have done a much better job in this respect. The Aspire 8950G doesn't at all feel comfortable outdoors. The combination of low brightness and glossy surface make it hard to see anything on the screen in either direct or indirect sunlight. Intense reflections develop. Reflections are just as much an issue indoors. At times, the only remedy is to dim the room. The display doesn't know the meaning of good viewing angle stability. Massive image falsifications turn up at the slightest deviations vertically. The viewing angles are somewhat more stable horizontally, but a relaxing movie night with several friends will nevertheless prove to be difficult. 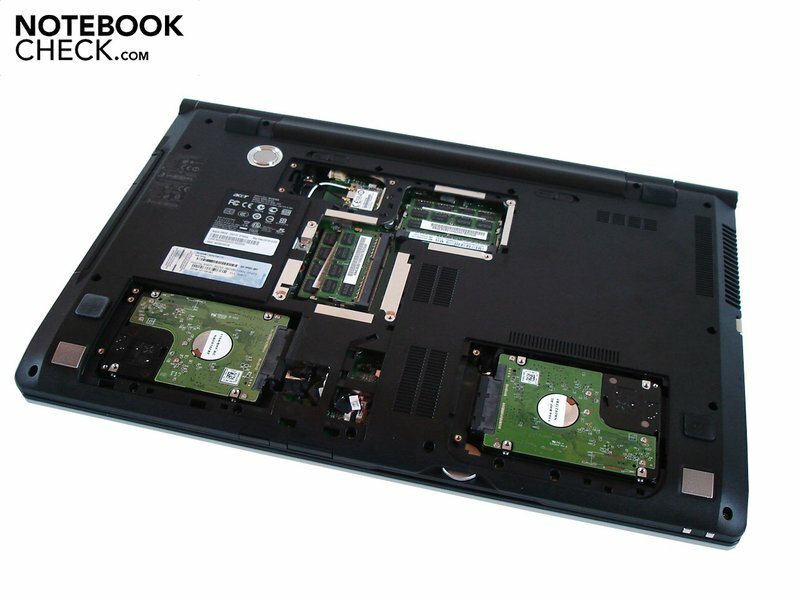 Acer has installed a fast quad core into the Aspire 8950G to ensure a high application performance. Intel's new Sandy Bridge generation not only makes the processors of its main rival, AMD, look old, but its own predecessors as well (see test). The Core i7-2630QM is manufactured in state of the art 32nm process and runs with a base clock rate of 2.0 GHz. However, 2.0 GHz is not the limit due to the Turbo Boost function. Providing the temperature and load situation allow it, the clock rate is increased up to 2.9 GHz. 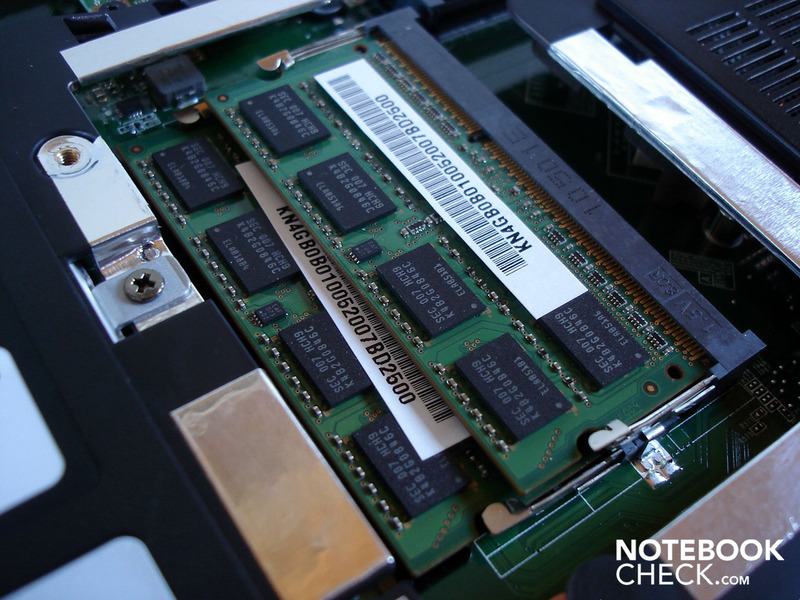 995 million transistors and a six MB sized L3 cache are even more guarantees for an excellent performance. The so-called Hyper Threading technology is rather more interesting for professional users than for gamers. By simulating four virtual cores, the Core i7-2630QM is able to process a total of eight threads simultaneously. In view of an incorporated graphics chip (HD Graphics 3000, not available in the Aspire 8950G), the Core i7-2630QM's power consumption is acceptable (TDP: 45 watts). The Core i7-2630QM can unrestrictedly exploit its strengths in the benchmark program, Cinebench R10 (64bit). The old Core i7 CPUs don't even have the slightest chance in single core rendering. The Core i7-720QM installed in the Aspire 8943G is beaten by 24% with 4617 to 3737 points. The advantage becomes even greater in multi core rendering: 16996 to 9725 points stand for an enormous plus of 75%. So, a high CPU performance has been taken care of, but what does it look like for the graphics card? One of AMD's latest models serves as the graphics card, namely the Radeon HD 6850M (codename: Granville Pro). Customers shouldn't, however, let themselves be deceived by the name. According to our benchmark records, it is ultimately a renamed Radeon HD 5850, which had found utilization in various notebooks for several month (e.g. 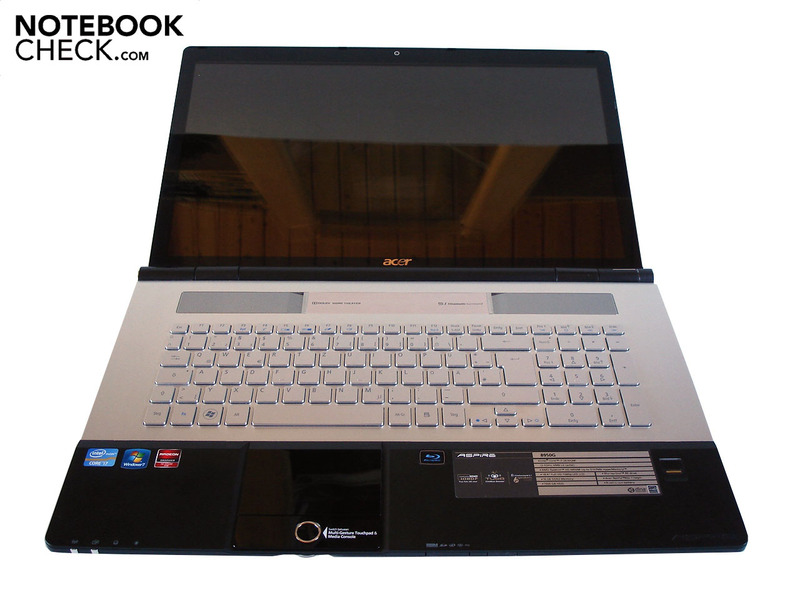 Packard Bell EasyNote LX86). The Radeon HD 6850M thus inherits the same strengths and weaknesses. The performance should actually place itself between the midrange and high-end category in view of 800 unified shaders and a 2048 MB VRAM. Unfortunately, cutbacks have been made on the memory bus. 128 bit are simply no longer contemporary anymore. The performance is limited, especially when higher resolutions are used in combination with the utilized DDR3 memory. Thus, it basically only suffices for the midrange. Only a faster GDDR5 VRAM would lift the Radeon HD 6850M into the high-end sector. Regardless of that, Acer hasn't made any modifications to the clock rates. 675 MHz (core) and 800 MHz (memory) comply with the standard. In terms of features, the Radeon HD 6850M – manufactured in a 40nm structure width – is up-to-date. Gamers will mainly be happy about DirectX 11 support. Before we deal with the graphic tests, one important note has to be made. Our test device regrettably struggled with a serious problem, which almost made it impossible to complete this review. The screen froze or rendered a black screen immediately after loading a benchmark routine, respectively a saved game, in about 70% of all cases. Whilst we partly could return to the desktop via Crtl +Alt + Del, we sometimes had to reboot the system completely. 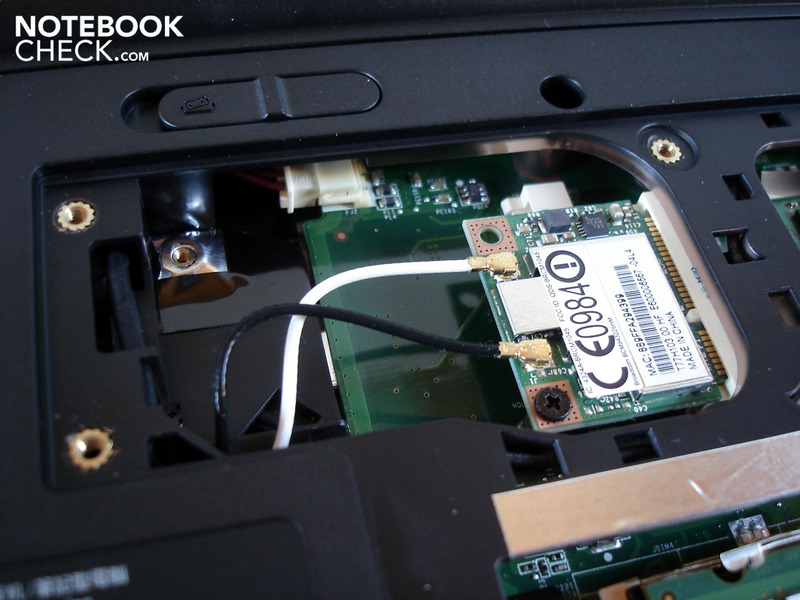 Since Aspire 5950G and Aspire 7750G owners have reported very similar problems, this issue will likely apply to more than a few Acer notebooks that have a Radeon HD 6850M. The way we see it, the source should be looked for in the driver. Reason: The system always spat out the error message "the display driver has been restored after a failure". In any case, the latest AMD driver, version 8.812.0.0 (Catalyst 11.1) didn't improve anything. Just only 4 out of the 15 tested games worked. Only 2 out of 6 graphic benchmarks could finish. Acer actually should have discovered such a problem in the run up. The Radeon HD 6850M's graphics performance can be called good. 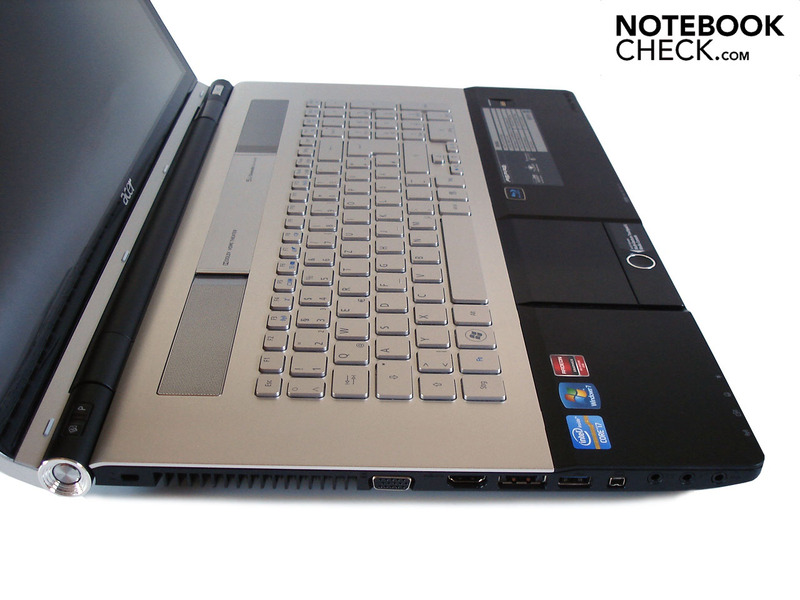 The Aspire 8950G can slightly surpass the predecessor model, Aspire 8943G (Radeon HD 5850) with 5052 to 4945 points. Nvidia's GeForce GTX 460M, which is found in equally priced, or even cheaper notebooks, only has a tired smile for this result: 6677 points add up to a difference of 32% (Asus G73SW). On the other hand, both graphic cards evidently close in on each other in 3DMark 11 based on DirectX 11. The GeForce GTX 460M has the lead on the Radeon HD 6850M by 11% with 1812 to 1632 points. 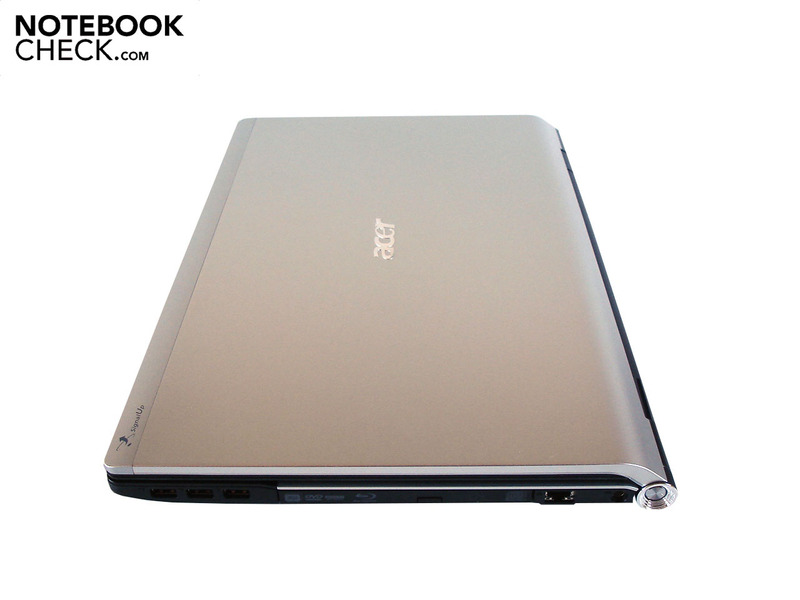 The bulky case contains two (easy to access) hard disk slots, which Acer has equipped with two 750 GB HDDs. A total capacity of 1500 GB provides enough memory for even larger media collections. The WDC WD7500BPVT-22HXZ from Western Digital can score with a good average transfer rate of 75.0 MB/s (system HDD, HDTune), despite a speed of merely 5400 rpm. A sequential read rate of 86.59 MB/s and a sequential write rate of 86.27 MB/s are just as impressive (system HDD, CrystalDiskMark). Had Acer set up the HDDs as a RAID 0 configuration, or relied on hybrid models or SSDs right away, an even better hard disk performance would have been possible. The Aspire 8950G's application performance moves within a high standard. 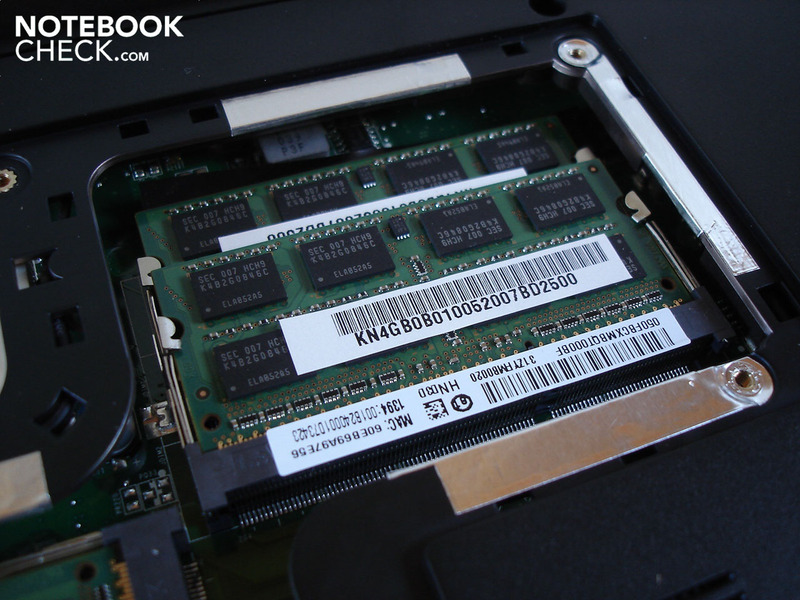 The notebook is perfectly equipped for all requirement profiles in the next years to come with Intel's extremely strong Sandy Bridge processor. You can confidently forget about upgrading the RAM in future. Eight GB would have sufficed instead of (an exaggerated) 16 GB of DDR3 RAM. In comparison to the other components, the graphics card doesn't do as well. AMD's Radeon HD 6850M quickly finds its limits due to the combination of DDR3 memory and a 128bit interface. Acer should have at least opted for a GeForce GTX 460M in view of a price of about 1800 euros – even if the Aspire 8950G isn't seen as a gaming notebook. The Aspire 8950G has to prove its facilities once more in the gaming benchmarks. You will now learn how the Radeon HD 6850M measures up to the GeForce GTX 460M (Asus G73SW, Core i7-2630QM) and if there is a measureable difference to the Radeon HD 5850. The very popular multi-player shooter, Bad Company 2, is too much for the 6850M in maximum quality settings. The first-person shooter stutters along considerably with 18.8 fps when high details, 4xAA (antialiasing), 8x AF (anisotropic filtering) and a resolution of 1920x1080 are used. The Radeon HD 5850 computes just as "fast". 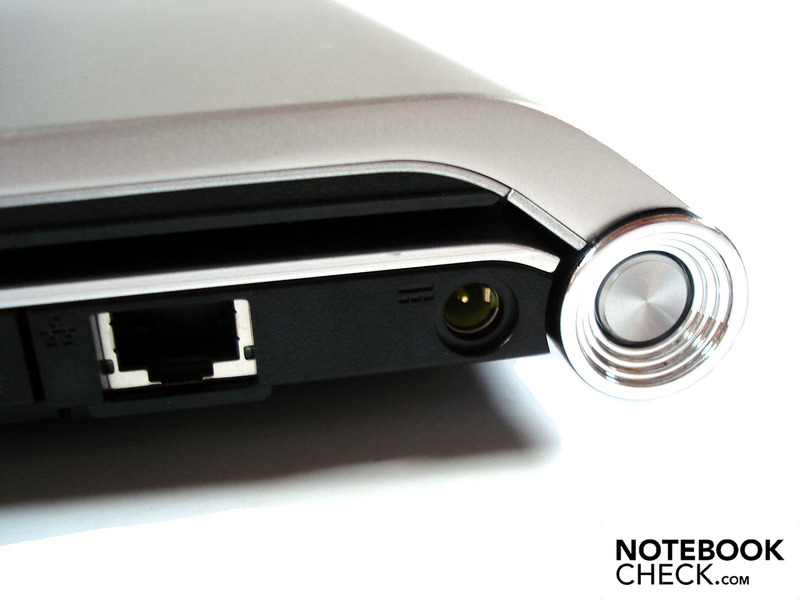 The Aspire 8943G (Core i7-720QM) achieved 18.6 fps in our test. The GeForce GTX 460M can't provide a throughout smooth frame rate either, but 30.1 fps is nevertheless a better result of 60%. Fifa 11 isn't a problem for the Radeon HD 6850M thanks to its low hardware requirements. High details, 4x AA and a resolution of 1920x1080 result in a very good 60.5 fps. The GeForce GTX 460M nevertheless plays in yet higher leagues: 136.2 fps is a remarkable plus of 125%. Incidentally, the processor has an impact that shouldn't be underestimated. 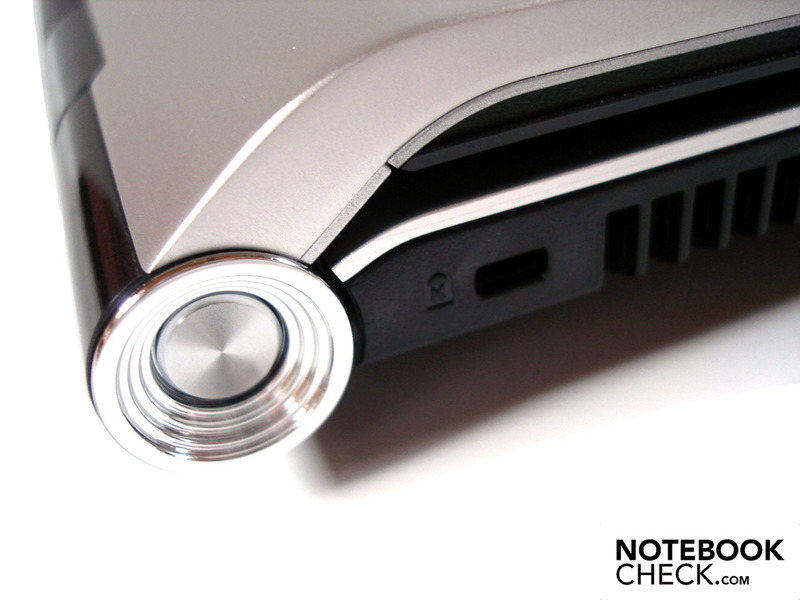 The Radeon HD 5850, combined with a Core i5-450M, places itself at 54.9 fps (Packard Bell EasyNote LX86). The Aspire 8950G fails completely faced with the extremely graphical demanding first-person shooter, Metro 2033. The Radeon HD 6850M has a very hard time even without DirectX 11 mode and FullHD resolution. 1600x900 pixels, high details, AAA (analytical antialiasing) and 4xAF lead to an unplayable 19.5 fps. While the Radeon HD 5850 lines up slightly behind that with 19.0 fps (Aspire 5943G, Core i7-720QM), the GeForce GTX 460M excels them by 29% (25.2 fps). The Radeon HD 6850M looks good in Resident Evil 5's incorporated benchmark. High details, 4xAA and a resolution of 1920x1080 are rendered fairly smooth with 33.5 fps. 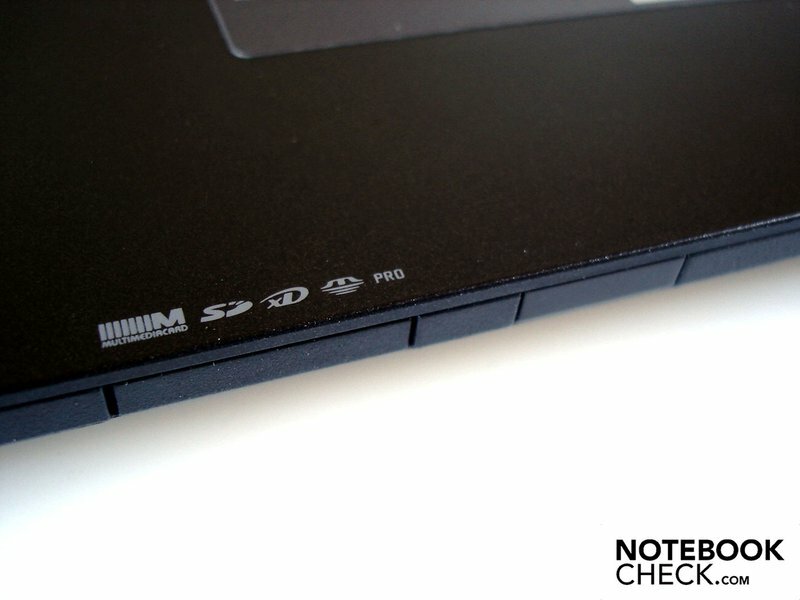 A combination of Radeon HD 5850 and Core i5-450M lags slightly behind with 31.1 fps (Packard Bell EasyNote LX86). The GeForce GTX 460M is again in a category of its own. The difference to the Radeon HD 6850M adds up to 44% (48.3 fps). All in all, the Radeon HD 6850M is a sufficiently strong graphics card. Current tracks can usually be played in the native FullHD resolution in medium or high details. The user merely has to be content with a low detail level in extremely hardware demanding games like Metro 2033. You shouldn't overdo it too much with quality enhancements in general – especially antialiasing reduces the performance notably. Not much has changed in comparison to the old Radeon HD 5850. The Radeon HD 6580M's performance is on par. The Radeon HD 6850M isn't really suitable for demanding gamers since the AMD GPU definitely lacks the reserves for upcoming games. Other graphic cards supply a significantly higher performance. For example, the GeForce GTX 460M computes 50% faster. To say it again: the graphic performance is simply too low for 1800 euros. We find the noise development adequate. The case fan rotates along slowly in idle mode. The notebook behaves pleasantly quiet here, except for a short speed increase. In return, the optical drive doesn't belong to the quietest representatives. Both DVD and BluRay rendering end up in a slight whirr. The drive even allows itself to get carried away and becomes an annoying noise. The fan increases to a very audible level under load. Games are drowned out in quieter scenes. However, the Aspire 8950G is never really loud. A level beyond 40 dB(A) wasn't even surpassed under full load (Furmark + Prime) (15 cm distance). At least we can't complain about the case temperatures in idle mode. All surfaces remain within pleasantly cool regions without load: 20°C is an excellent rate. The top's temperature increases up to 35°C under load, which results in slightly warm hands. The bottom primarily heats up in the fan's vicinity. It can get uncomfortable on the lap with a maximum of 44°C. It looks pretty much the same for the components. While the temperatures of the processor and graphics card are fully acceptable in idle mode (not quite 40°C), high, but still unalarming 85°C are reached under full load. We also noticed the Intel's Core i7-2630QM clocked down to meager 1.7 GHz in short intervals during our stability test over several hours (Furmark + Prime). Since all speed measurements met the expectations, there is no need to worry about this. (+) The average temperature for the upper side under maximal load is 30 °C / 86 F, compared to the average of 32.9 °C / 91 F for the devices in the class Gaming. (+) The maximum temperature on the upper side is 34.6 °C / 94 F, compared to the average of 39.3 °C / 103 F, ranging from 21.6 to 68.8 °C for the class Gaming. (+) In idle usage, the average temperature for the upper side is 20.7 °C / 69 F, compared to the device average of 32.9 °C / 91 F.
The 18.4 inch size makes it possible for Acer to use a sophisticated sound system. 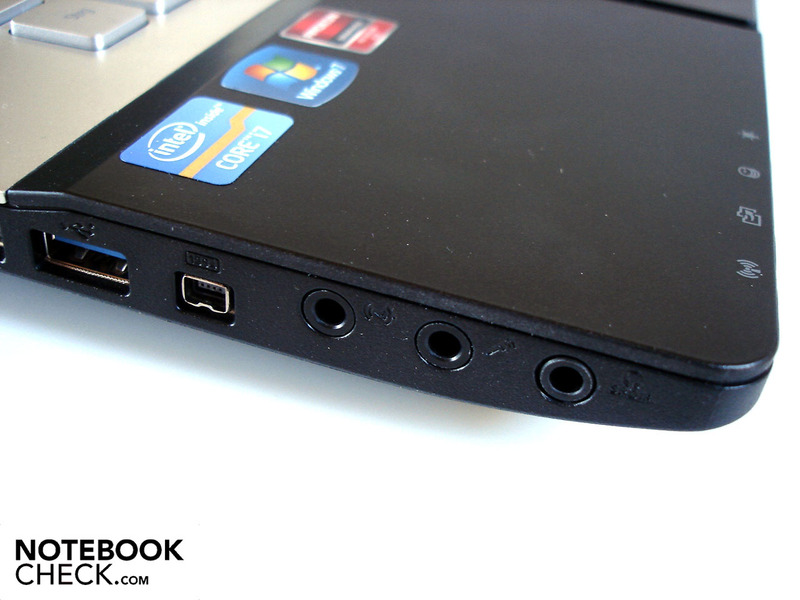 The Aspire 8950G is equipped with a 5.1 system that consists of five speakers and a subwoofer. 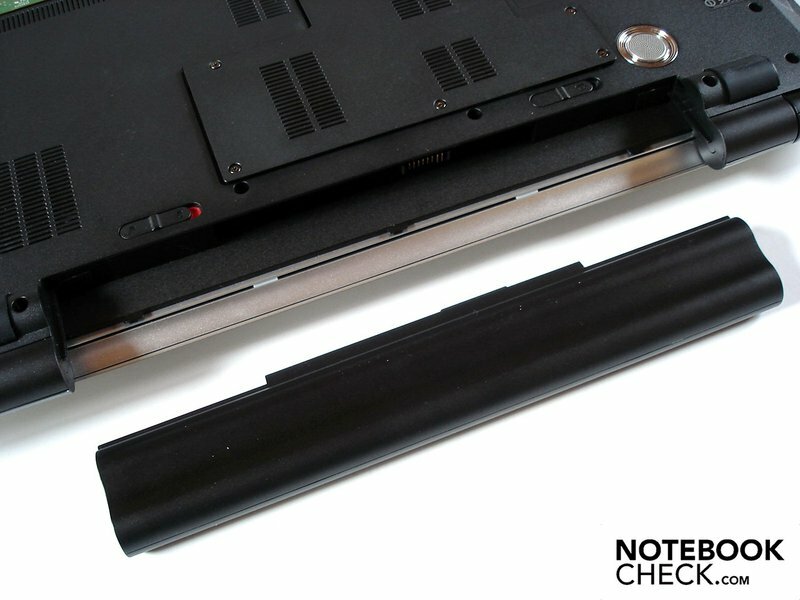 The notebook deserves special praise for its high maximum volume. The speakers hardly ever have to be turned up beyond 50%. The 18 incher can collect extra points for its Dolby Home Theater support, which allows easy adjusting to movie, music and game scenarios via loudspeaker properties (see screenshot). The sound system could only convince us to a part in terms of its sound qualities. 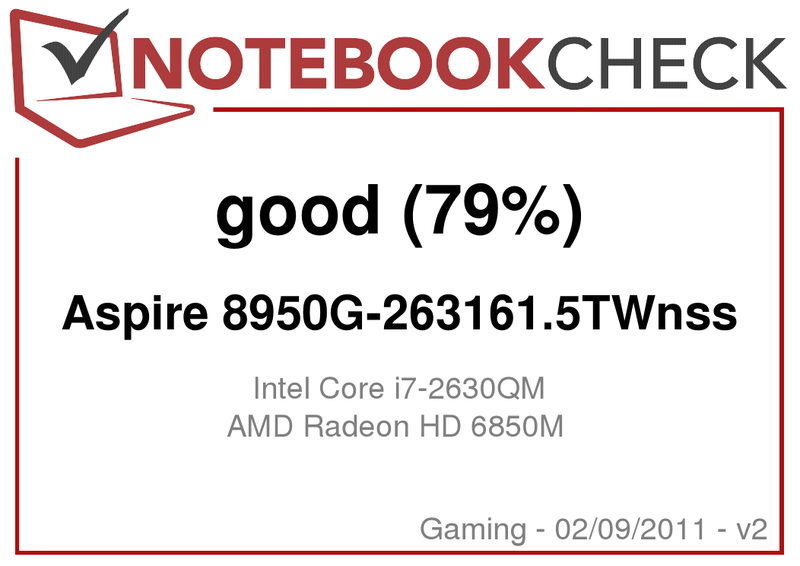 Overall, the Aspire 8950G scores better than the majority of other notebooks. Nevertheless, all frequency ranges are rendered somewhat muffled and beyond that not very precisely. The bass is only indicated despite the subwoofer. High pitches are rather neglected. If you put value on the highest sound quality possible, you will likely be better served with the Asus N73JQ, the Asus G73SW or the Dell XPS 17. 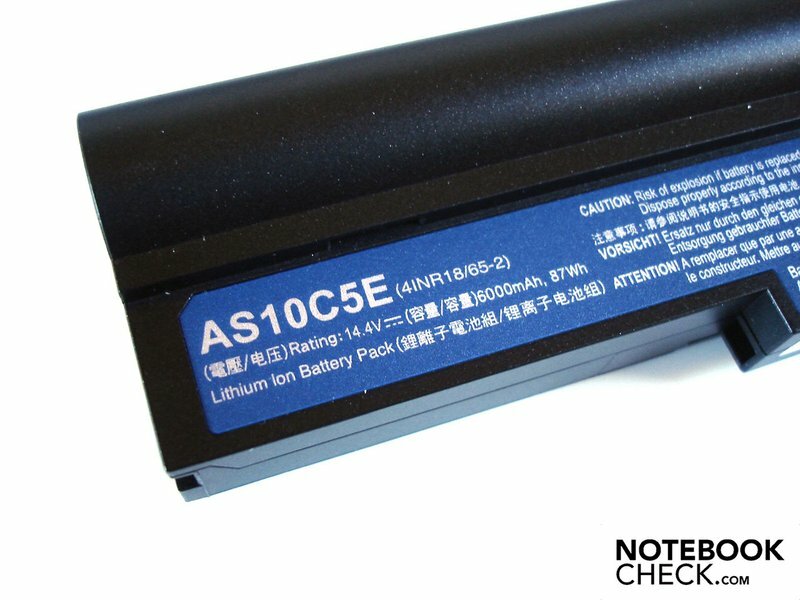 Although Acer has waived on manual switching between the incorporated and dedicated graphics unit, the Aspire 8950G's battery runtimes are above average. The main reason for this is the lengthy eight cell battery that has extraordinary capacity of 87 Wh, respectively 6000 mAh. For example, we achieved six hours and 14 minutes in minimum brightness and maximum energy saving options in BatteryEater's Reader's Test – a decent result. The notebook also felt very comfortable during wireless surfing. 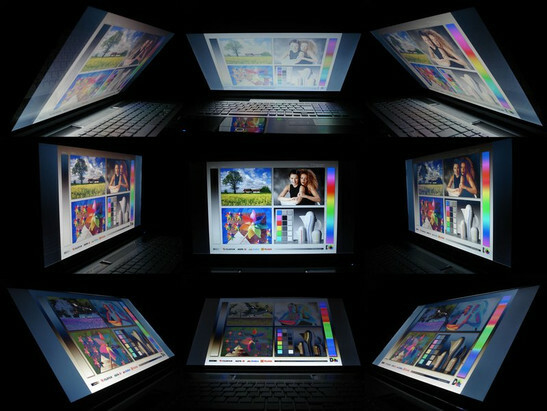 The screen first turned black after four hours in medium energy savings options and maximum brightness (Firefox 3, incl. Adblock). The battery life decreased to three hours and 10 minutes in DVD rendering, which is more than sufficient for almost all blockbusters. This account is just as true for BluRay rendering, whereas two hours and 50 minutes are exactly 20 minutes less. The mobility diminishes considerably under load. BatteryEater's Classic Test stopped after only just 61 minutes with maximum brightness and disabled energy saving options. Not only has the battery life increased notably, but the power consumption has also improved slightly in comparison to the Aspire 8943G (Core i7-720QM, Radeon HD 5850). Instead of 17.8 – 32.8 watts in idle mode and 75.9 – 113.7 watts under load, the Aspire 8950G now only consumes 14.9 – 22.0, respectively 65.2 – 117.2 watts. The refresh from Acer's aspiring Ethos range is, in our opinion, only a partial success. Especially the excellent application performance would have to be mentioned on the pro side. Currently, there is hardly an application that can trouble Intel's speedy Sandy Bridge processor. The lavish configuration is one more strength: 16 GB of DDR3 RAM, a hard disk capacity of 1.5 TB and a BluRay burner solidify the desktop replacement claim. There's hardly anything to complain about in terms of emissions – unlike the predecessor, Aspire 8943G. Temperature and noise development are fully acceptable, particularly in idle mode. The perfectly manufactured and elegant case, as well as the relatively good battery life, also let the 18 incher stand out from the competition. Unfortunately, a vast amount of flaws dim the otherwise positive overall impression. While the omitted graphic switching, the disagreeable touchpad surface and the suboptimal interface positioning (no ExpressCard slot!) likely won't bother everyone, the moderate display will probably be reason for much disapproval. No matter if brightness, black value, contrast, colors or viewing angles: every single aspect is definitely worthy of improvement. There would also have been a lot more possible in terms of gaming performance. Without GDDR5 VRAM, the Radeon HD 6850M's performance is limited pointlessly. We find the price of 1800 euros overall inflated in view of what's offered. Considerably faster notebooks with higher quality displays are available for the same money (e.g. 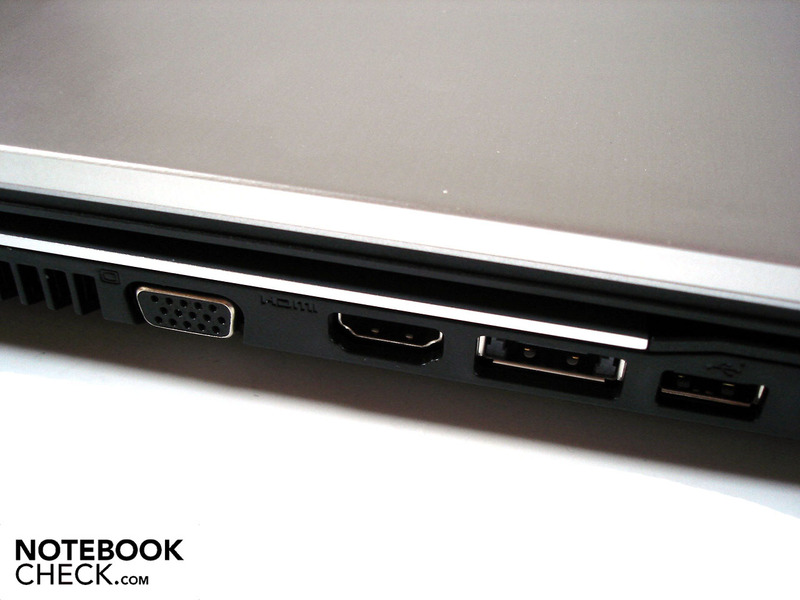 Asus G73SW or DevilTech Fragbook DTX). Note: We have deliberated the existing graphics problems with a deduction of 2% in personal rating (= impression). The total rating would be 80% without faults. The four arrow keys are extremely narrow. Most keys are well sized. AMD's Radeon HD 6850M unfortunately doesn't have GDDR5 VRAM. The optical drive can also burn BluRays. Intel's Core i7-2630QM processes extremely fast. The left key enables the multimedia center "Arcade Deluxe". 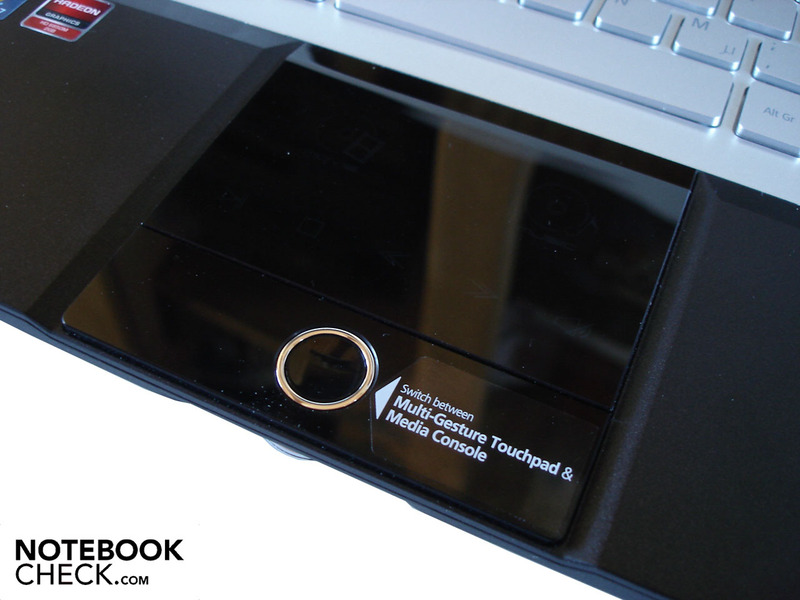 The touchpad has two operating modes. Two speakers hide on the bottom. WLAN and Bluetooth can be conveniently disabled/enabled. 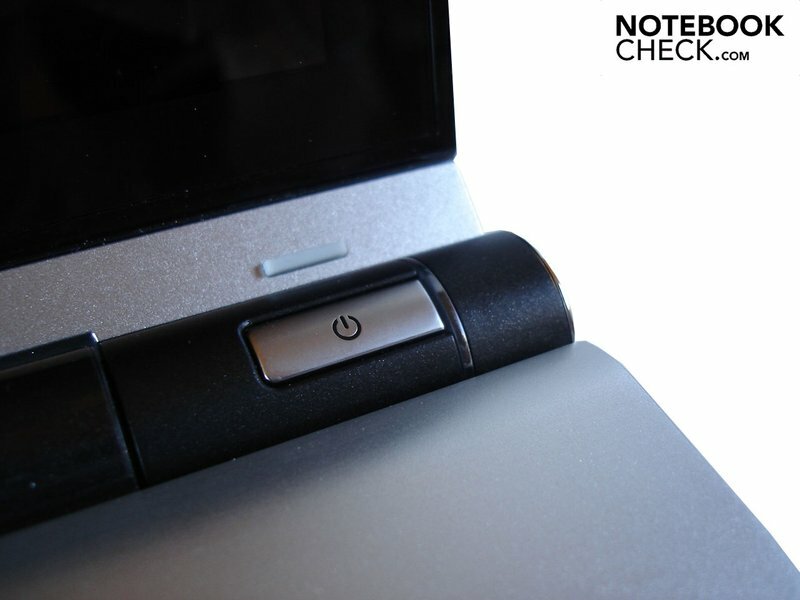 Acer has even installed a fingerprint reader. 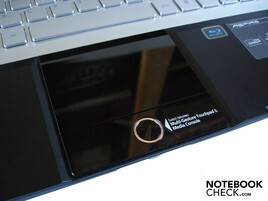 The cardreader is proficient of five formats. Three USB 2.0 ports are in immediate vicinity of each other. The Aspire 8950G's design is probably unique. A Kensington lock enriches the left. External monitors can be connected via VGA and HDMI. The Aspire 8943G didn't have a USB 3.0 port. Acer has installed a 5.1 sound system. 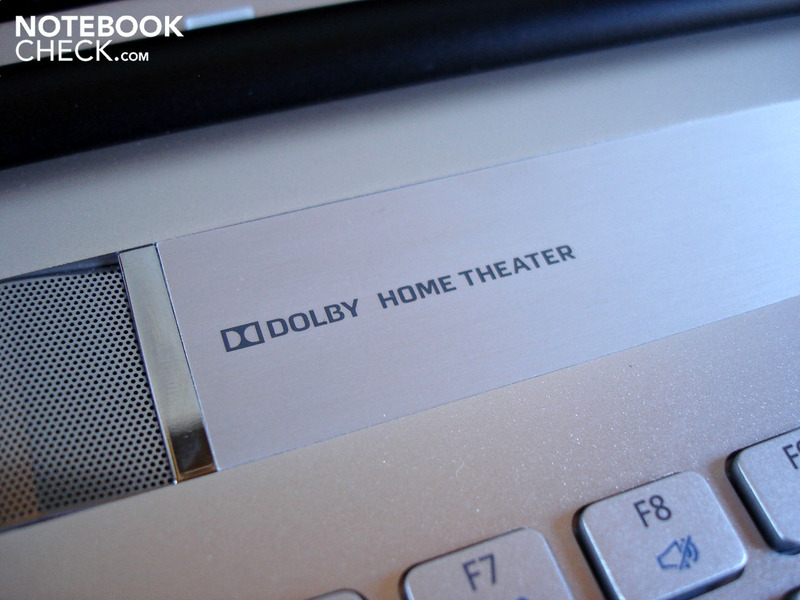 The notebook supports Dolby Home Theater. Various changes in color create highlights. The maximum opening angle is nearly 180°. The high gloss display is very reflective. A majority of connections are very far in the front. The vent is on the left. 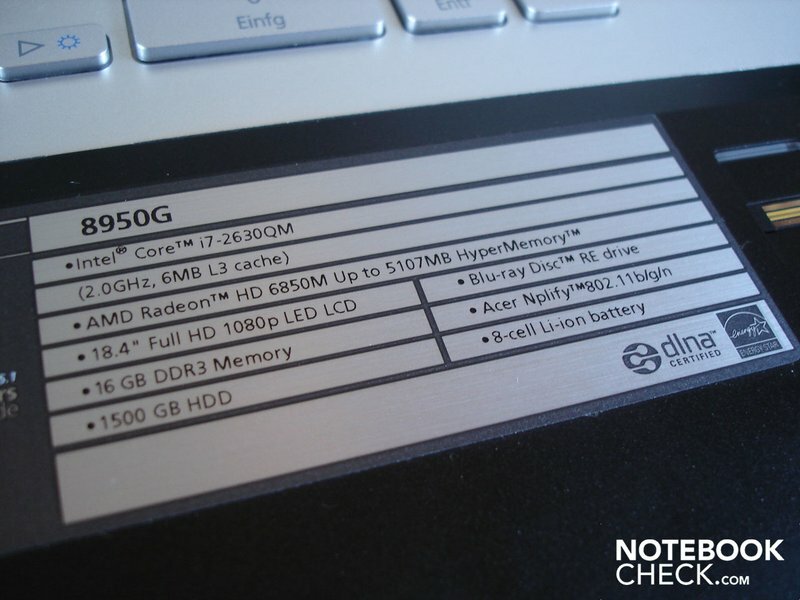 The Aspire 8950G's design is throughout successful. Unfortunately, processor and graphics card aren't accessible. 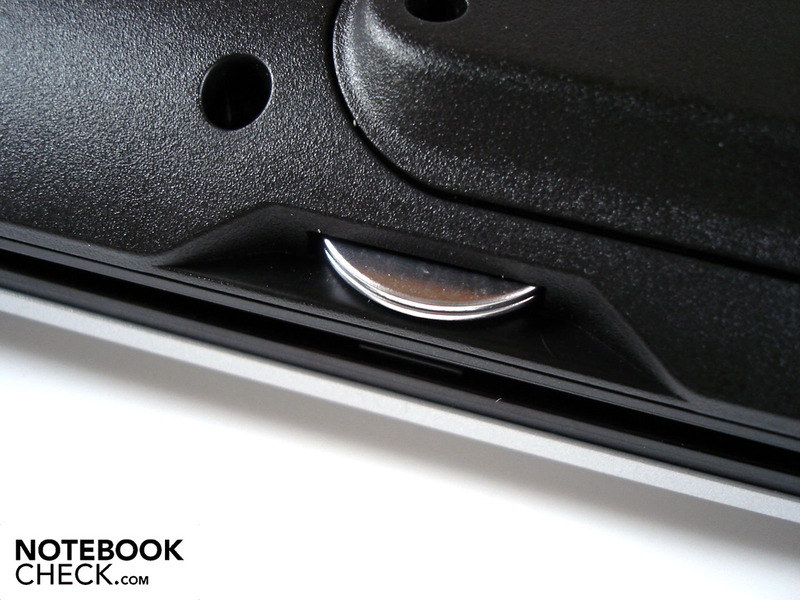 The 18.4 inch case contains two hard disk slots. 16 GB of DDR3 RAM can be called lavish. Wireless communication is possible via WLAN and Bluetooth. All four memory banks are fully occupied. Both HDDs bid a capacity of 750 GB each. The lengthy battery takes up almost the entire rear. 87 Wh is an indication for good battery runtimes. Two covers can be screwed off the bottom. The webcam has a resolution of 1.3 megapixels. The bass is rather weak despite subwoofer. A practical volume dial is hidden on the front. The 120 watt adapter has a moderate size. Acer has been creative in terms of design. An adequate graphics card matching to the steep price. 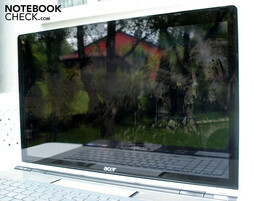 Why Acer has made such cutbacks on display quality. 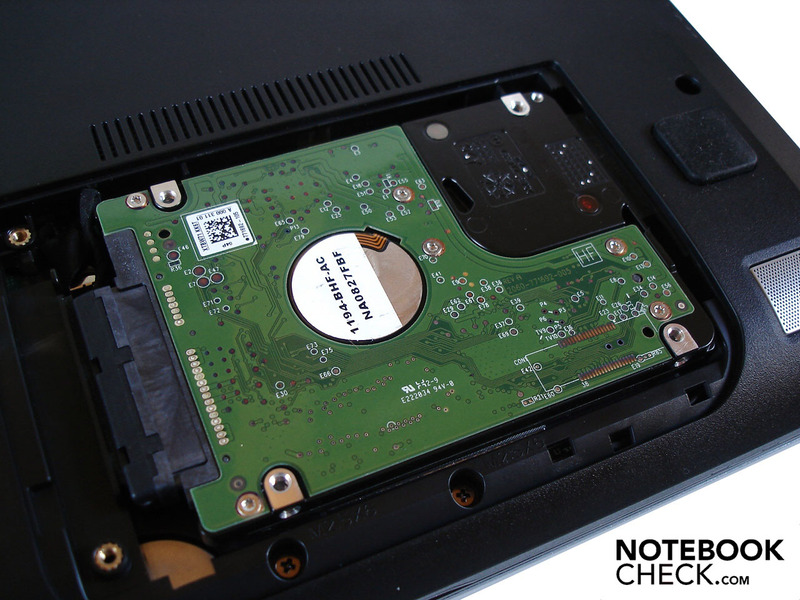 Strong multimedia or gaming notebooks. That would mainly be the company own predecessors in the 18 inch field. Aspire 8943G, Aspire 8942G and Aspire 8940G etc. 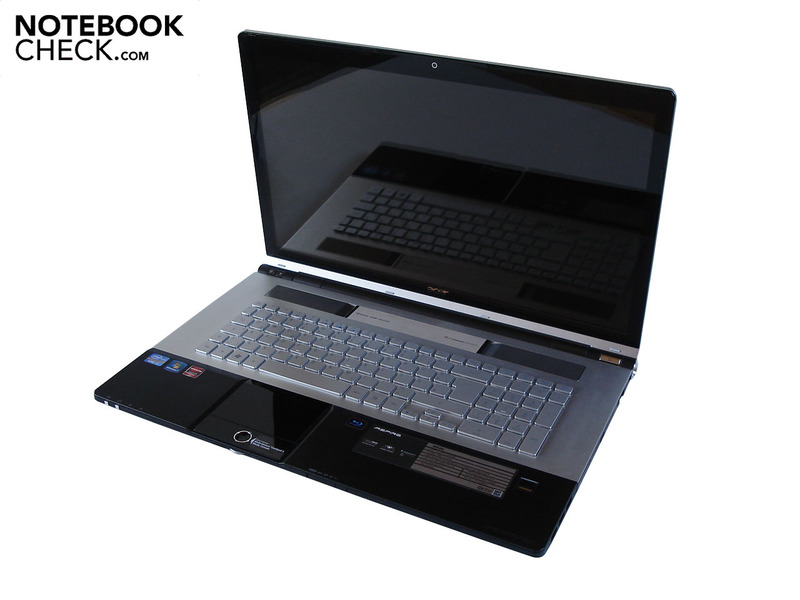 In the 17 inch field, for example Aspire 7745G, the Aspire 7750G, the Asus G73SW, the Alienware M17x R3, the Dell XPS 17, the DevilTech Fragbook DTX or the Packard Bell EasyNote LX86.